Start spelling words with style on the beach. Surfside Scramble is a lot of fun as a summer game for the kids and keeps them learning while also having fun. Surfside Scramble is a spelling game where players try to spell words with their flip-flop letters. This game is very similar to other games produced by its manufacturer but the theme is different. Works great as a match to a beach themed party. Learn how to officially play the game below and let us know what you think of Surfside Scramble. Grab your copy today! The player with the most points at the end of 5 rounds is the winner. 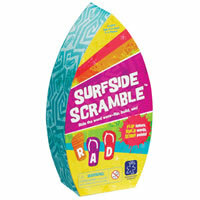 You get 4 surfside game boards, 60 double-sided flip-flop letters, storage bag, score pad, 2-minute timer and the official Surfside Scramble game rules and instructions. Please keep in mind that the official Surfside Scramble childrens rules and instructions could be different depending on the game version you have. The rules below are some of the exact directions on how to play Surfside Scramble. Share with us your comments, funny stories, tips, advice, strategies, creative ways to play, questions about how to play, problems with the rules or anything you want about Surfside Scramble. All submissions will be reviewed within 24 hours. Click here to add your Surfside Scramble comments.